The women in Katara Village, Kichwamba Sub County, in Rubirizi district under their association Katara Women’s Poverty Alleviation Group (KWPAG) are making a living out elephant dung. The group entered into an agreement with Uganda Wildlife Authority (UWA) that permitted them to access the resources necessary for their activities from Queen Elizabeth National Park. 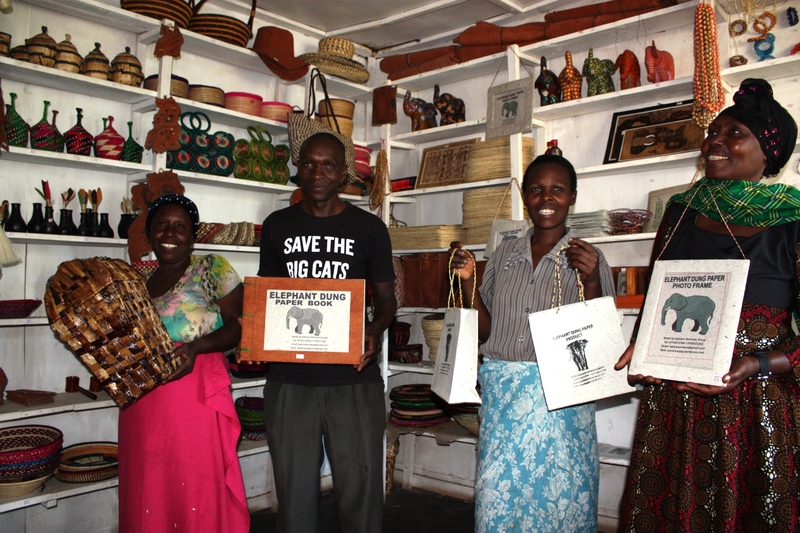 Elephant dung is one of the raw materials the group uses to make elephant dung papers from which they make different products like books, necklaces, folders and beads. According to Fatuma Barugahare, a member of the group, there has been remarkable household income improvement amongst the members of the community which has improved the livelihoods of the members and the community at large. “WWF has really helped us realize our dreams. Almost all members have had a chance to save some money and at the end of the year they can purchase an asset in the home. I have personally paid school fees for my child who is in S6,” she said. The women’s group was started in 2005 with a membership of eight women and two men including Moses Agaba-the founder of the group. According to Agaba, the group was founded with an aim of improving household income and sustainable development of the community that had for long suffered the effects of human-wild conflict as the elephants encroached their gardens. WWF engaged the group under Strengthening Sustainable Environment Natural Resource Management Climate Change Adoption and Mitigation in Uganda (SENRMCAM) in 2013-15 and currently under Scaling up Natural based resources enterprises, which has since increased the membership to 70 members that include 65 women and 5 men. The group started the saving scheme in 2010. Every group member was a qualified member of the saving scheme. Members were required to pay shillings 10,000 as annual subscription and shillings 1,000 as a monthly saving. At the end of the year, each member would get their annual savings. Today the group saving scheme has grown to shillings 20,000 annual subscription and shillings 10,000 as monthly savings o each member. The group currently has about 4 million on their account. Katara Women’s Poverty Alleviation Group earns high incomes from the sale of different products of which 50% is allocated to the group account, 25% given as a motivation to the individual that made the product, 20% is reinvested in buying raw material and 5% is used to buy some basic needs for the orphans whose parents were killed by elephants. The group also recently got involved in bee keeping with about five bee hives and piggery with five pigs. The members are optimistic that the new projects (apiary and piggery) will very soon grow as they expect about 50 new bee hives from WWF in the next financial year.